In case you haven’t heard, Friday will be Retro Night at Citizens Bank Park. In addition to the usual PhanaVision and ballpark shenanigans, both the Phillies and Brewers will be wearing some sweet throwback uniforms, with the Phillies donning an awesome pillbox cap. Now, the Phillies are doing a tribute to the ’70’s as a fun promotional theme just for tonight, but in a way, one could argue that the Phillies could repeat what they did 40+ years ago in more ways than simply what garb they play in. The 1970’s didn’t start off so well for the Phils. They accumulated a record of 270-371– a .421 winning percentage from 1970-1973. They finished 2nd to last, and last for three straight years. That’s not far off of the last four years for the Phillies, where they have posted a record of 235-305–a .435 winning percentage. They’ve finished second to last in 2013, last in 2014 and 2015, and are second to last so far this year. Back to the ’70’s–after that string of bad seasons, the Phillies–and Mike Schmidt–turned up the heat a bit in 1974. Schmidt led the team in WAR for the first time of what would be six straight years leading the team, and led the league in home runs (36) as well as slugging percentage (.546). The Phillies finished just two games under .500 and finished 3rd in the division. This was the turning point. In 1975, they got a little better, and finished 10 games over .500 and 2nd in the division. Schmidt again led the league in home runs with 38. Then came a string of three straight trips to the NLCS, albeit unsuccessful ones. Schmidt was an All-Star in two of those years, and finished 3rd in MVP voting in 1976. The Phillies posted a 292-194 (.600) record in those three years. They had a down year in 1979, but we all know what happened in 1980. Winning a World Series is a difficult thing to do, so I’m not saying that this current Phillies team is on their way to winning one in the coming years, but they have a chance to be a dominant team, much like the Phillies of the late 70’s were. The similarities are there. They could have another third baseman that is an absolute monster at the plate in Maikel Franco. They could have another dominant pitcher in Aaron Nola (or will it be Vincent Velasquez?) that could be their version of Steve Carlton. Also the next group of multi-time All-Stars like ’70’s standouts Greg Luzinski, Larry Bowa and Bob Boone could all currently be on their way through the pipe line in the forms of Nick Williams, J.P. Crawford and Jorge Alfaro. The point of all this is that there’s hope. 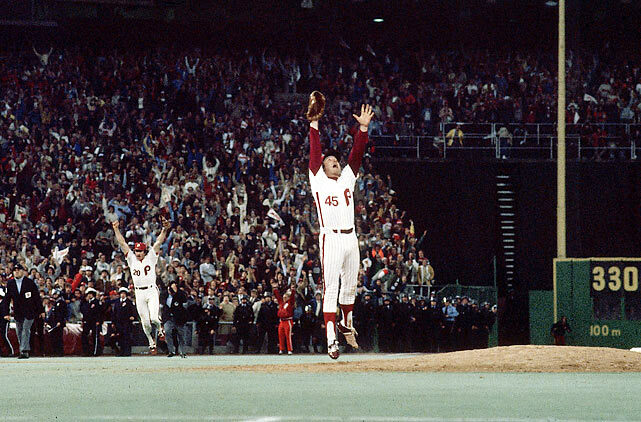 The 1970’s Phillies were able to turn it around and eventually win a World Series by the end of the decade. I like to think the 2010’s Phillies have a decent shot at doing the same.